This is the time of year when, despite all our best efforts, our skin starts to look pasty and gray and gets kind of flaky. 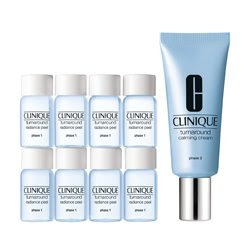 In an effort to put a halt to all that nonsense, we tested the new Clinique Turnaround Radiance Peel. You apply one vial of the peel once a week before bedtime for 8 weeks. The glycolic-based peel is recommended for Type 3 and 4 (oilier skins). We’re a Type 2, but our skin responds well to peels so we figured it was worth a shot. To use: apply the peel to a cotton pad and sweep it all over your face and neck. Then follow with the Calming Cream, which is included in the kit. We tried it last night and were very pleased with the results. We had no tingling at all from the peel. When we woke up this morning, our skin was super-smooth, noticeably brighter and absorbed our moisturizer quickly. The flakiness? Gone. The 8-week kit costs $55–A serious bargain when you consider that’s about half the price of one average facial!